I was surprised to find this toy selection guide in a major mass merchandiser environment. 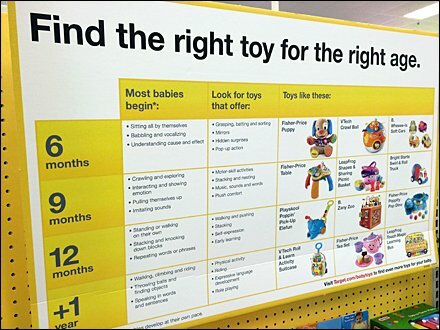 Toy and baby specialty retail take note please. Many needing a gift for your little darling might not have children of their own, have forgotten childhood development stages, or just be outright dumb manlike me. In store help is good for all … the child, the gift giver, and the store’s sales. Thanks for this help. CLICK through the gallery for various details.